A large number of volumes have been produced summarizing the work on generation and control of rhythmic movements, in particular locomotion. Unfortunately most of them focus on locomotor studies done on animals. This edited volume redresses that imbalance by focusing completely on human locomotor behaviour. The very nature of the problem has both necessitated and attracted researchers from a wide variety of disciplines ranging from psychology, neurophysiology, kinesiology, engineering, medicine to computer science. The different and unique perspectives they bring to this problem provide a comprehensive picture of the current state of knowledge on the generation and regulation of human locomotor behaviour. 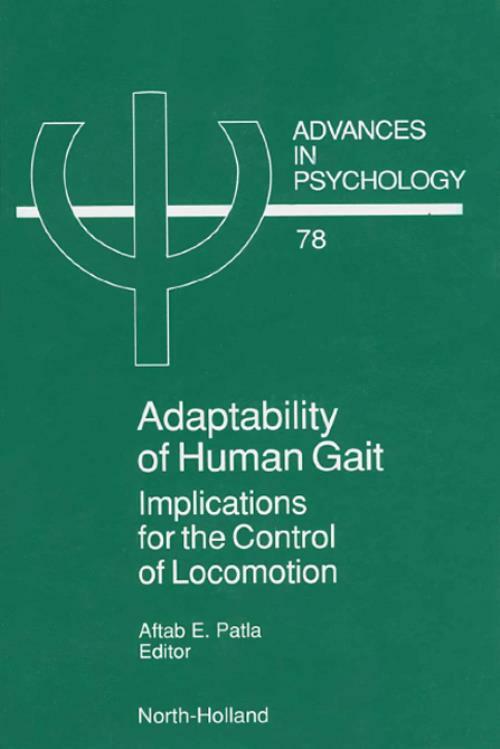 A common unifying theme of this volume is studying the adaptability of human gait to obtain insights into the control of locomotion. The intentional focus on "adaptability" is meant to draw attention to the importance of understanding the generation and regulation of "skilled locomotor behaviour" rather than just the generation of basic locomotor patterns which has been the major focus of animal studies. The synthesis chapter at the end of the volume examines how the questions posed, the technology, and the experimental and theoretical paradigms have evolved over the years, and what the future has in store for this important research domain. Introduction. Understanding the Control of Human Locomotion: A Prologue (A.E. Patla). The Role of Proprioceptive and Vestibular Inputs: Local Adaptability. Reflex Modulation During Locomotion: Functional Significance (R.B. Stein). Significance of Proprioceptive and Vestibulo-Spinal Reflexes in the Control of Stance and Gait (V. Dietz et al.). The Role of Vision: Prospective Modulation of Gait. Visual Control of Human Locomotion (A.E. Patla). Visual Cues and Processes Involved in Goal-Directed Locomotion (M. Laurent). Other Approaches to the Study of Human Gait. Adaptability of the CNS in Human Walking (D.A. Winter et al.). Stability and Variation in the Development of Infant Stepping: Implications for Control (B.D. Ulrich et al). The Biomechanics of Normal Gait: Implications for Control. The Mechanics of Human Walking (A. Cappozzo). Intersegmental Dynamics During Gait: Implications for Control (R.F. Zernicke et al.). The Modelling of Control of Human Locomotion. Dynamic Musculoskeletal Models of Human Locomotion: Perspectives on Model Formulation and Control (G.T. Yamaguchi et al.). Execution of Voluntary Bipedal Movement with a Simple Afferent Processor (H. Hemami). Development of Legged Robots and Animation of Human Gait. Development of Biped Robots (J. Furusho and A. Sano). Animation of Human Gait (A. Bruderlin and T.W. Calvert). The Rehabilitation of Locomotor Abilities. The Control of Locomotion when Vision is Reduced or Missing (G. Jansson). Surgical Intervention in the Correction of Primary and Secondary Gait Abnormalities (J.R. Gage and S. Ounpuu). New Rehabilitation Strategies for the Treatment of Spastic Gait Disorders (C.L. Richards et al.). Strategies for FES: Implications for Control (D.B. Popovic). Conclusion. Understanding the Control of Human Locomotion: A "Janus" Perspective (A.E. Patla). Index.